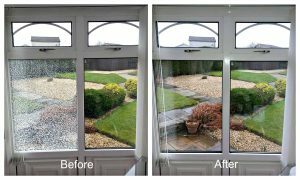 If you have misted-up or broken double glazing or glass, it doesn’t mean you have to replace the whole window. There are many common problems with double glazed units – The glass can become misted-up on the inside, broken, steamed-up, can crack or shatter. Do you have condensation in your double glazed sealed unit, and can’t seem to clean it off. This is because the seal has broken down inside the unit and allowed moisture to enter causing your double glazing to become misted-up. That’s where we can help. Our local glass engineer will measure your failed double glazed unit and provide a FREE ‘No obligation’ quote. Your replacement sealed unit will be manufactured to the same dimensions of your current glass for a perfect fit, we’ll even safely dispose of your old glass when we come and fit your new unit/s. Although we don’t do costly emergency glazing, we can still replace a broken or shattered glass unit the same way we would a failed unit. Most of the time a broken double glazed unit only breaks or shatters on one side anyway so it’s usually safe enough to stay in place for a few days whilst we get a replacement for you. Mowing the lawn a stone hits a window/door, but only breaks one side of the double glazed unit. It can often work out much cheaper coming straight to us to replace your broken double glazed unit unit, rather than you going through your insurance. When you add the cost of the insurance excess, and increased cost of future renewals, it can often be cheaper and much easier dealing direct with us. It is also possible to use the latest energy efficient glass to increase the thermal performance of your existing windows & doors, and that’s in any room of the house. Our energy efficient glass can be up to 20% more energy efficient than standard glass, keeping your home much warmer in the winter and cooler in the summer. We often offer free upgrades to thermal glass too. Do you have leaded windows, toughened glass, internal Georgian bar designs, patterned glass, colours or bevels on a failed double glazed unit that need to be replaced? Don’t worry we can replace those like for like too. Our glass comes with a generous 10 year guarantee against seal failure resulting on condensation between the panes again. All of our replacement double glazed units comply with the latest British & European standards. We have all of our double glazed units filled with ‘Argon Gas’ which makes the glass 6% more energy efficient than most of our competitors. We offer a generous 10 year manufacturers backed guarantee on all double glazed units. We won’t be beaten on the quality and price of our glass..
With over 35 years’ experience in the glazing industry; WindowGeeks, the window & door specialist; offer you a cost-effective solution in replacing your failed double glazing, through a small team of 2 friendly LOCAL engineers covering Runcorn, Widnes, Warrington, St Helens and surrounding areas. 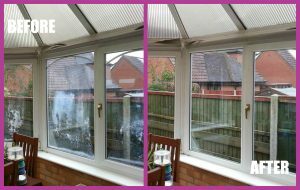 So if you have misted-up, fogged-up, cracked, or broken double glazing in a UPVC, wooden or aluminium frame or simply just wish to upgrade your glazing then remember to give us a call first for your FREE ‘No Obligation’ quote on 0800 5 118 887 or use our contact for Here.